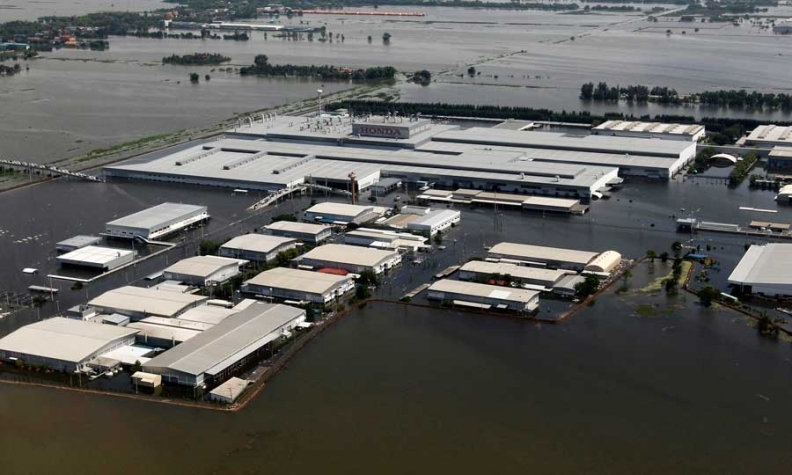 Honda has already had to close its car factory in Ayutthaya province due to the flooding. Toyota Motor Corp. widened global production cutbacks and Ford Motor Co. shut a Thai plant due to flooding, as Hynix Semiconductor Inc. said the disaster may cut personal-computer shipments in the first quarter of next year. Toyota, Asia's biggest carmaker, canceled overtime shifts planned for this week at plants in North America, and Ford suspended output in Thailand because of parts-supply shortages, the companies said separately yesterday. Shipments of PCs may drop, leading to lower prices for memory chips, if supply-chain disruptions from Thailand's worst floods in half a century last into 2012, Ichon, South Korea-based Hynix said today. Output losses from the floods that have inundated about 10,000 factories are spreading beyond Thailand as supplies of components for cars and computers are disrupted. Operating profit at Toyota may be reduced by 125 billion yen ($1.6 billion) as plant closures cut production by 250,000 vehicles through Nov. 20, analysts at Credit Suisse Group AG led by Kunihiko Shiohara said in a report dated yesterday. "Difficulties securing electronic components are likely to have increasingly significant impacts," Credit Suisse said in the report. Toyota's overtime cancellations will affect auto-assembly plants in Indiana, Kentucky and Canada and an engine factory in West Virginia, the Toyota City, Japan-based company said. The automaker is working to restock U.S. dealers after Japan's record earthquake and tsunami in March cut production, and has said it will operate North American plants with overtime shifts for the remainder of 2011 to rebuild vehicle inventory. Ford may lose production of 30,000 vehicles, Lewis Booth, chief financial officer at the Dearborn, Michigan-based carmaker, said yesterday on an earnings conference call. "Although our vehicle assembly plant is not affected, a number of our suppliers are," Booth said on the call. "We are working closely with our affected suppliers to return to production as quickly as possible." The floods may cause about 140 billion baht ($4.6 billion) of damage to manufacturers in seven industrial estates, Chantra Purnariksha, secretary-general of the Office of Insurance Commission, told reporters in Bangkok yesterday. Thailand's economy will grow less than 3 percent this year, damped by the effects of the disaster, central bank Governor Prasarn Trairatvorakul said Oct. 25. Water as deep as 3 meters (9.8 feet) in some places is leaking through levees north of Bangkok, and Prime Minister Yingluck Shinawatra warned today it may take up to a month before it drains into the Gulf of Thailand, south of the capital. All of Bangkok's districts may be flooded, depending on their elevation, she said. The city's flood defenses won't be able to keep out the massive flow of water, said Pracha Promnog, who heads the government's flood relief operations. "The flooding is beyond our control now," Pracha told reporters in Bangkok. Japanese automakers are losing production of about 6,000 cars a day because of the floods, the Japan Automobile Manufacturers Association said Oct. 20. Toyota halted output in Thailand on Oct. 11, and production has also been affected in Indonesia, Vietnam, the Philippines and Japan. The company said production of about 6,000 vehicles, including the Prius hybrid, could be affected by reduced output at four domestic plants. Honda Motor Co., Japan's third-largest carmaker, closed plants in Thailand and Malaysia after a factory in Thailand was flooded. Nissan Motor Co., Japan's second-largest automaker, has closed its Thai factory, citing parts shortages. Honda's global market share may continue to decline as it was the automaker most affected by the flood's and Japan's March earthquake, Moody's Investors Service said on Oct. 24. The Tokyo-based carmaker will postpone introducing its Life Diva minicar in Japan after the Thai floods delayed delivery of aluminum wheels for the model, Honda said this week.